Hi folks, I am a humble inhabitant of mother earth, thanking everything and everyone for permitting me to visit this planet , the duration of which though uncertain and intriguing , had so far been fairly satisfactory ( I mean , to me ) and enjoyable . I take interest in almost everything that I come across- Literature, Arts, Music and painting , Science , Socio political milieu around me etc. In fact it is this interest which carries me forwards. I do not think I have done anything for the society at large . But I also think in a state like Kerala ( in India ) where I live, where you will not be heard or appreciated without political overtones , it is one of the worst places to live ( to appreciate which one has to move out of Kerala or better, out of India) . Well, I have lived nearly 35 years of a medical man�s life, with my specialization being chasing images , not truth. Yes, I have been a Diagnostic Radiologist at least from 1978 and continues to be so. I had to occupy a lot of chairs clinical as well as administrative in this long route . 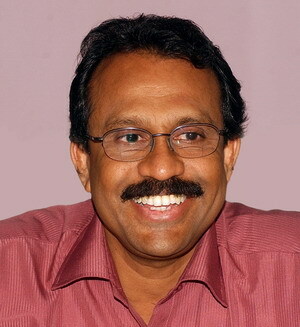 The 6 years in a semi independent seat at KHRWS Imageolgy Centre at Calicut Medical college ( 1997 to 2003) , 2 years in HNS of UK ( 2004 to 2006) and 18 months as Principal, Calicut Medical College ( 8/2006 to 12/2007) were wonderful and satisfying spells . The last 5 months of my Govt. service at Thiruvananthapuram as Director of Medical Education of Kerala state also had been quite wonderful, not because I was instrumental in suggesting any change in medical education ( I could not ) , but living in a great city was a great experience . My greatest city of adoration is London which I have explored at least 50 times . In a scale of 100, If I will give 50 % marks to Delhi, Calcutta and Chennai , I can give only a just pass mark of 40 % to my own home town which is calicut ( kozhikode) . A city breathes through its cultural lungs , not through the concrete jungles or its commercial spots . The media and politicians of my state are mediocre . And we , keralites are proud of promoting mediocrity. If anyone tries to excel, we collectively put him down. We have great connoisseurs of performing arts, but substandard film industry and deteriorating literary talents. We don�t love animals , plants, nature or for that matter humans too. I am also a live member of this dehumanized ( demonized ) , commercial, unloving sect commonly and widely called MALYALI as we were believed to be speaking a language called MALAYALAM as mother tongue, one of the dying languages which is unlikely to survive this century . And a bit of general knowledge � the permanent abode of MALAYALIS , called KERALA(M) constitutes hardly 1% of INDIA,s land mass , 3 % of INDIA,s population and every 5th MALAYALI lives out of Kerala some where in this planet . This site just is a repository to keep certain things together so that I don�t lose it. But believe me , I am available for any sort of help within Kerala for any one , especially small things which are very difficult to find in Kerala like informations . Copyright www.pvramachandran.com 2010. All Rights Reserved.